Do you like chewy sugar cookies that don’t turn crisp or hard over night? 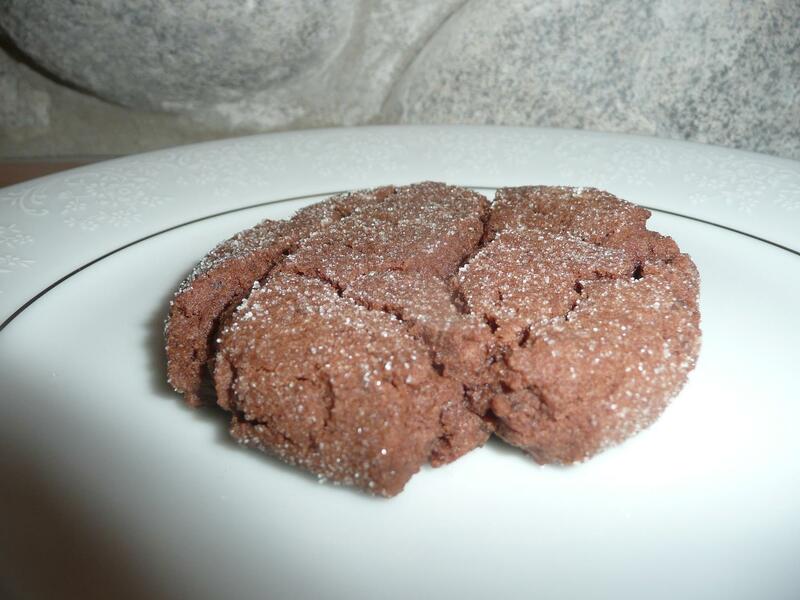 Then here is your recipe, a recipe for a yummy mocha sugar cookie that is chewy just great with a glass of milk or a cup of tea. My family loves sugar cookies but the most of the recipes I have are good the first day then they turn crispy the next day….not like the sugar cookies I remember as a kid. So back when the December 2010 issue of Cook’s Illustrated arrived there was an article on how to make classic sugar cookies. Well I thought I had tried every “classic” recipe there was and I was never able to get the chewy softer cookies that I found in bakeries. Leave it to Cook’s Illustrated to experiment with multiple variations before coming to what their testers think is best. Their testing from other recipes indicated that the key to a truly chewy texture is in the fat…”for an optimal chew, a recipe must contain both saturated (like butter) and unsaturated fat (like oil).” So a butter only cookie wouldn’t work and that’s what the recipes I made over the years called for. What they came up with is a fool proof recipe using both baking soda and baking powder for leavening plus butter and cream cheese for the saturated fat along with vegetable oil for the unsaturated fat. Since I’m “No Plain Jane “ I couldn’t just make a regular ordinary white sugar cookie. No way! Instead I added cocoa powder and instant coffee or espresso for a mocha delight sugar cookie. So here’s the recipe that I developed based on the one from Cooks Illustrated. I think the recipe is very flexible so I’m going to be trying other variants of it such as a key lime sugar cookie. The only problem with testing cookie recipes is my kids aren’t home to eat them so the honor goes to me and my husband…which we don’t need. Get 2 cookie sheets prepped with either parchment paper or Silpats. I find that parchment paper works best for this recipe because the cookies spread out more with the Silpat. I haven’t tried making the cookies on just a greased cookie sheet…let me know if you do try it. Blend flour, baking powder, baking soda, cocoa powder and instant coffee/espresso powder in a bowl. Place 1 ½ cups of sugar and the cream cheese in a mixing bowl and pour the warm butter over it and whisk to combine, it may still be a little lumpy but don’t worry about that. Whisk in the oil until it is incorporated. Then whisk in the egg, milk and vanilla. Add the flour mixture and mix to combine. Do not overwork the dough or the cookies will turn out flat. Put the ¼ cup of sugar and the 1 tablespoon of cocoa for rolling onto a plate. I use a small cookie dough scoop that is about 1 tablespoon in size (a dough scoop looks like a smaller version of an ice cream scoop) to scoop out the dough…this way I get consistent size cookies. You can use any size scoop just adjust your baking time if using a larger scoop. Take each piece of dough and roll it in the sugar/cocoa mixture and place on the cookie sheet. Take a small glass like a juice glass and flatten the dough ball slightly. Put one pan at a time in the oven and bake until the edges are set about 10 to 12 minutes (may need longer if you use a larger scoop for your cookies. Cool the cookies on the baking sheets for 5 minute. Then transfer them to a wire rack for cooling. You can omit the cocoa, instant coffee and 1 tablespoon of milk for a delicious regular sugar cookie. Since I’m “No Plain Jane “ I couldn’t just make a regular ordinary white sugar cookie. No way! Instead I added cocoa powder and instant coffee or espresso for a mocha delight sugar cookie. So here’s the recipe that I developed based on the one from Cooks Illustrated. I think the recipe is very flexible so I’m going to be trying other variants of it such as a key lime sugar cookie. The only problem with testing cookie recipes is my kids aren’t home to eat them so the honor goes to me and my husband…which we don’t needJ. This entry was posted in Recipes and tagged chewy cookies, chocolate cookies, Cookies, espresso cookies, mocha, sugar cookies. Bookmark the permalink. These look delicious, Jane. I love a good sugar cookie and anything from Cooks Illustrated is usually great! I learn a lot from Cook’s Illustrated and I appreciate the way they conduct their testing and explain everything they are doing. Kind of like having a test kitchen right in my house. I have GOT to go eat breakfast; I want to stop at every post I see and make it and devour the results! These sound terrific Jane; wishing I had some cream cheese on hand, they would be in the mixer in minutes! I’ve been enjoying Cooks Illustrated lately. And learning alot from them. That cookie looks WONderful.